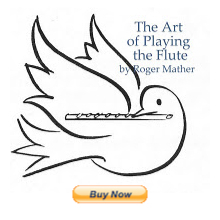 Here is a PDF that may be of interest to flute players who are just starting private lessons, or who are interested in working their way up the pyramid to the higher levels of flutistic achievement. Again, it's the result of a discussion on Galway's Flute Chat about "why are flute students coming to my masterclasses without knowing their etudes, technique and scales?" The Flute Triangle: levels of development for flute students. I am 27 years old and after years of regretting quitting playing the flute at age 13 ( I played for 2 years and was advanced to Honor Band in my school.. ) Long story short..teenagers don't always make the best decisions.. stupidly I quit.. Anyway, about 4 months ago I bought myself a good student/beginner flute and started re-teaching myself the basics. I plan on getting a private teacher very soon, but I didn't want to start lessons without brushing up first...I've been very dedicated to practicing after work and on weekends as much as my schedule allows me. After seeing this pyrmaid though, I can't help but feel a tad discouraged, I feel too late/old.. I want to get a private teacher but now I feel afraid they won't take me seriously.. I want to aim for the top but am I too late?? I believe that the "top" of the triangle is "world class" flute player. Did you want to go that far? It would be like trying to become a world champion in the Oympics. Why not just aim for the best that YOU can be? I began to play the flute 18 months ago, just before my 46th birthday. It’s never too late, if you enjoy playing – ok, you might not get to be a professional, but starting young is no guarantee of that either. Don’t wait to start having lessons, you’ll get better, faster, with a good teacher. Of course they will take you seriously, if you’re prepared to put the work in. Just wanted to follow up and say that I put things in better perspective and what you said is true, that I should just aim to be the best I can be. I will go as far as I can until I can go any further.. and then I'll try a different route.. hehe.. I will try to set smaller goals for myself instead of just jumping for the end result.